If your household is like mine, then there is a buzz in the air that has had everyone going crazy, and that buzz is Minecraft, a game where you collect and break apart blocks that you then use to build houses and other structures within a virtual world. 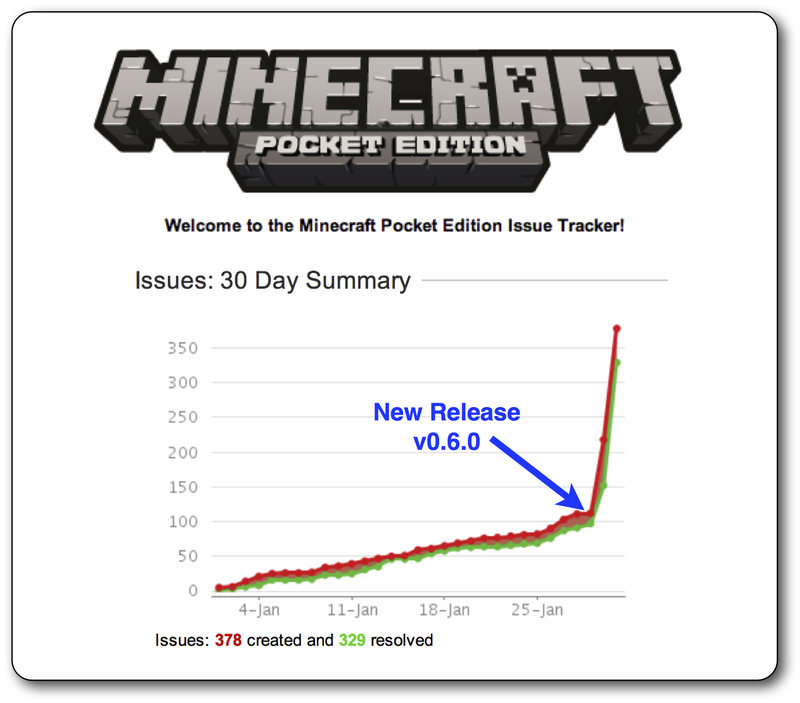 That buzz has reached a fever pitch now that Mojang has just released an update to its iOS app. As with any app, sometimes the update comes with its share of new bugs (see chart below). So a good rule of thumb before updating is to save and backup your worlds — since neither Apple(s AAPL) nor Mojang will do it for you in this release. The game has grown into a farming and hunting game where players spend a considerable amount of time growing and expanding their worlds: so much time, in fact, that knowing how to save and back up your worlds should become a routine part of your Minecraft gaming experience. While there are plenty of online forums, wikis and guides that can walk you through steps to set up and maintain online servers for the computer version of the game, there is not much information on how to preserver and maintain the mobile version of the game. The following guide will outline the steps necessary to preserver older versions of Minecraft Pocket Edition for iOS that you have purchased from the Apple App Store, back up the worlds you have created when playing, and restore both prior version fo the game as well as the worlds that you created with that version of the game. Before you perform any of these steps, it is highly recommended that you backup your device to over the wire to iCloud or locally to iTunes. The apps that you have purchased from the App Store are downloaded to your Mac and stored as part of your iTunes Library in what is called an IPA file. To locate the IPA file on your Mac simply option + click on the app in iTunes and select “Show in Finder.” This will take you to the Mobile Applications folder located in your iTunes Library under at ~/iTunes Library/iTunes Music/Mobile Applications. Here you will want to copy the version of Minecraft that you may later want to restore. Since version 0.6.0 just came out this week, it is a good idea that you make a backup copy of version 0.5.0 before you download the new version. 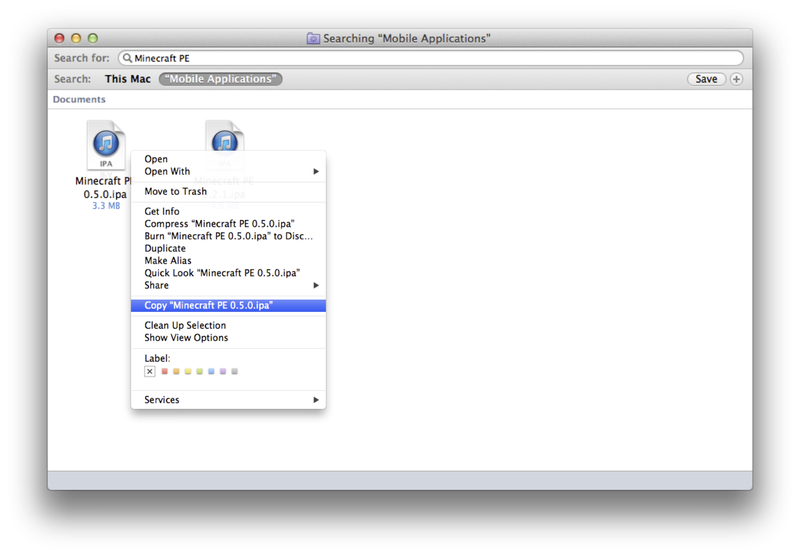 If you have already downloaded the latest version, use Time Machine to go back and restore the previous version. You must use the same IPA file that you downloaded from the App Store with your iTunes account, you cannot use someone else’s backed up copy. PhoneView ($29.95 Mac) from ecamm, the makers of Printopia, is an application that can access your iOS devices filesystem in order to access the information stored on your device. This includes the documents that are created by each app on your device. It just so happens that for Minecraft PE, the world files are stored in a manner that is easy to back up and restore. You do not need to jailbreak your device in order to use PhoneView to back up and restore your Minecraft PE worlds. Before you get started, make sure Minecraft is not actively running on your device. 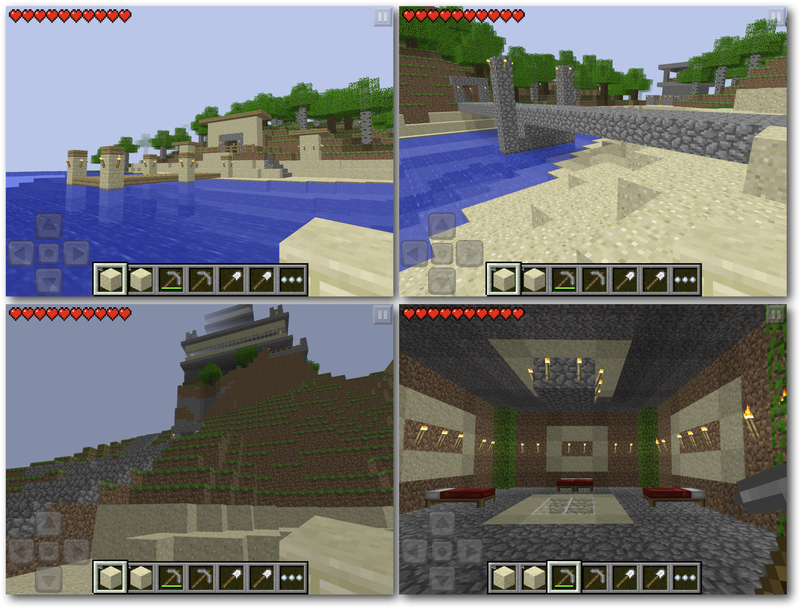 Then using PhoneView, navigate to the Minecraft PE app located under the list of apps you have installed on the device. Here you will see a folder structure that looks something like ./Documents/games/com.mojang/minecraftWorlds. 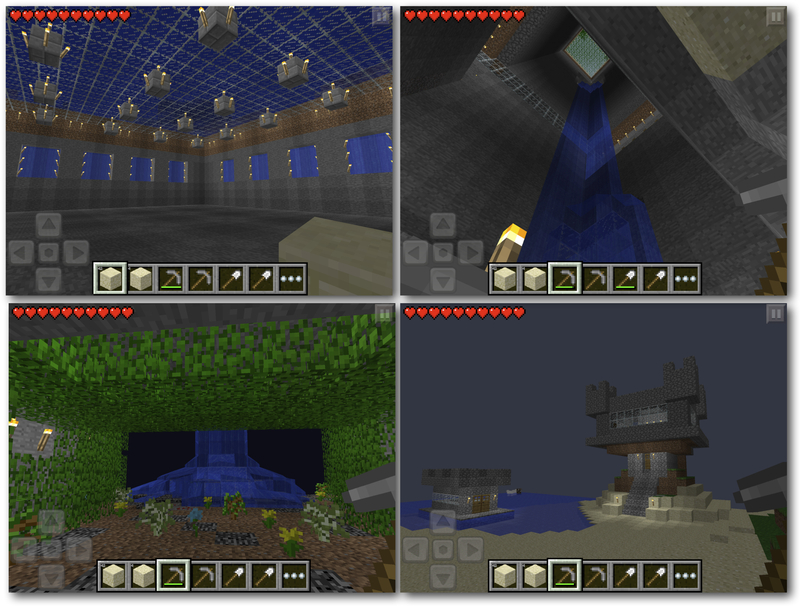 Located within the folder titled MinecraftWorlds are each of the worlds you have created. Each world is stored in its own folder. 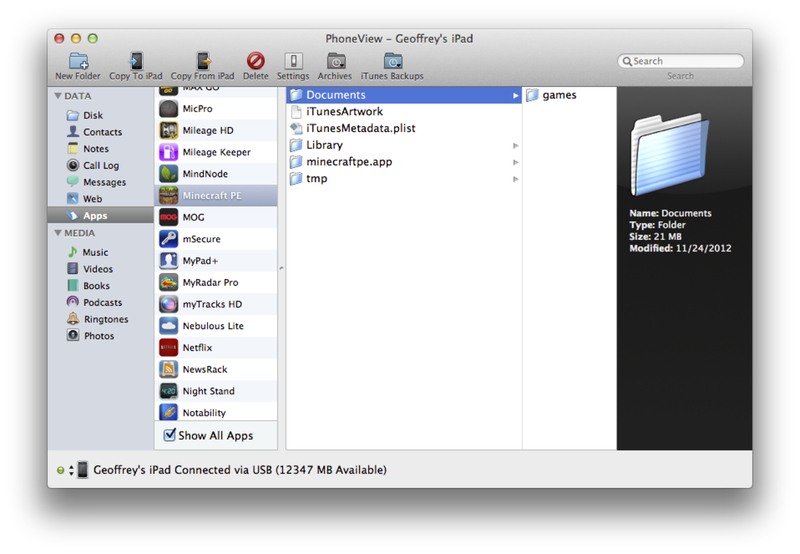 You can copy all of your worlds onto your Mac by simply dragging and dropping each folder. Be sure you copy the entire folder. The restoration process is just as simple as the backup, only in reverse. Before you can restore the prior version of an app using iTunes, you must first remove the latest version from your iTunes Library and your device. 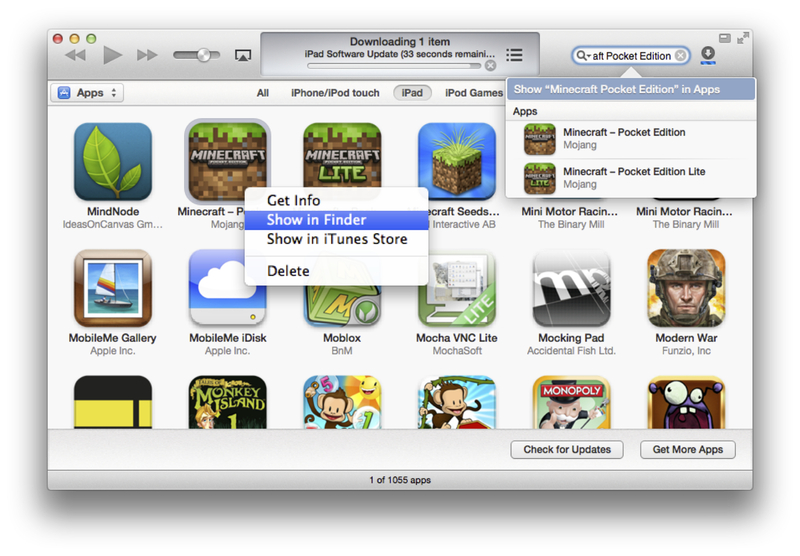 Once removed, you must shut down iTunes and copy the previous version of the app back into the same Mobile Applications folder you originally backed it up from using the Finder. Restart iTunes and you will see Minecraft PE in your list of apps once again. Now all you need to do is attach your device to your Mac and drag and drop the app from within iTunes back on to your device. In order to restore your worlds, you will just drag and drop the backed up folders located on your Mac back onto your device using Phone View. Again you will navigate to the Minecraft PE app located under the list of apps you have installed on the device and locate the same MinecraftWorlds folder you originally copied the backed up worlds from. Then you simply drag and drop them back on to your device. This technique does not require you to jailbreak your iOS device, and cannot be used to copy someone else’s IPA files onto your device. It will only work with IPA files that you used your devices iTunes account to purchase. I would not recommend mixing and matching worlds that you create in more recent versions of Minecraft, with restored backups of games from earlier versions of Minecraft. Worlds that you have created or modified in version 0.6.0 of Minecraft PE should only be accessed by version 0.6.0 and later. It is therefore a good idea to keep each backup in a folder that you can clearly identify which version of Minecraft was used to modify it. This technique will help you keep the Minecraft PE worlds you spent so much time creating. the phrasal verb is to back up, not to backup, like stand up or shut up. backup is a noun, same as startup, which is something that starts (space) up. in English you’ll often just mash the words together to form the noun, which (don’t forget it) derives from the phrasal verb, but using a hyphen is usually fine and sometimes better.